A Cameroonian government minister says the decision by the Confederation of African Football (Caf) to withdraw the country from hosting the 2019 Africa Cup of Nations is "unfair" and a "blatant injustice." Caf announced on Friday that its executive committee had withdrawn Cameroon as hosts because of delays in preparation for the tournament, due to start in June. Cameroon's Minister of Communication, Issa Tchiroma Bakary said the government was "dismayed." "In the face of this blatant injustice, the government of the Republic urges the people of Cameroon to remain calm and not to indulge to futile arguments," said Mr Bakary. There had been much scrutiny on Cameroon ahead of the Caf executive committee meeting on Friday, with focus also on the security situation in the northern and Anglophone regions of the country. Delays in construction were an issue, but Mr Bakary says the country is determined to ensure the projects will be completed despite fears that some of the work may now be abandoned. "Cameroon has put in a creditable performance. It shall prove it to the entire world by completing with this same determination and on time the construction of this modern infrastructure belonging to the Cameroonian people. This surprising decision for more than one reason is certainly unfair with regard to the huge investment made by our country which has led to outstanding, modern infrastructure as witnessed by all," Mr Bakary added. On the streets of Cameroon, the news that the country had been stripped of hosting rights for the 2019 Nations Cup was welcomed by many people, especially from the Anglophone regions. "I am very happy with the decision because this is the time to solve our problems. 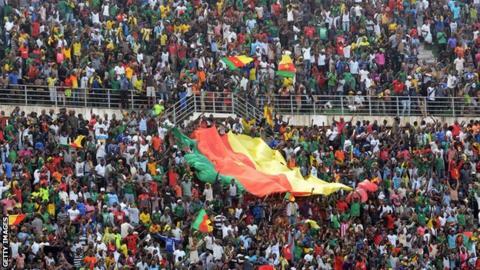 Cameroon is not in the position to host the 2019 Afcon because of insecurity. I am from the Anglophone region and I am not happy," said Pa Henry, a resident in Yaounde. Another, Rene, said the country is not in a position to host a football tournament. "Cameroon should look into its problems. My bothers have been dying for the past two years. It is not time for football or partying." Caf said that countries interested to host the 2019 Nations Cup have until the end of December to submit their bids before a decision is taken and that "Cameroon remains a serious candidate to organise a future edition".